BUDAPEST, Hungary, November 15, 2011 (ENS) – Persistent illegal trade in caviar involving Bulgaria and Romania is undermining the survival of the endangered sturgeons of the Danube River Basin, finds a new report from the international wildlife trade monitoring network TRAFFIC. Commissioned by the global conservation organization WWF, the report shows a total of 14 seizures of illegal caviar originating from Bulgaria (27.5 kg in five seizures) and Romania (25 kg in nine seizures) were reported by EU Member States between 2000 and 2009. 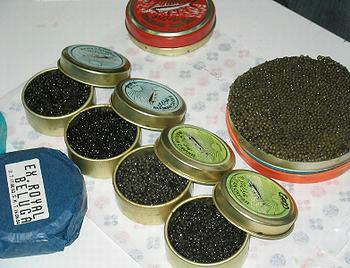 Neither Bulgaria nor Romania have reported any illegal caviar seizures. Originating 200 million years ago, sturgeons have outlasted the dinosaurs, but today most species are Critically Endangered, according to the IUCN Red List. Bulgaria and Romania host the only viable populations of wild sturgeons in the European Union, but five of the six native sturgeon species in the Danube Basin are listed as Critically Endangered, and sturgeon fishing there has been banned. “It is of concern that Bulgaria and Romania reported no seizures of caviar, while other EU Member States registered several seizures where those two countries were implicated,” said TRAFFIC’s Katalin Kecse-Nagy, who authored the report. “The detected quantities are not very high, but we must bear in mind that the real volume of illegal trade is likely to be considerably higher and any illegal trade poses an unacceptable risk to these highly threatened species,” she said. In May, Bulgaria imposed a fishing ban on sturgeon, which matches a ban on the opposite Romanian bank of the Danube. “The Romanian moratorium came into force in April 2006, but considering that the Danube serves as a national border between Bulgaria and Romania, a one-sided ban cannot have any impact if fishermen on the other side are still catching the fish,” said WWF sturgeon expert Jutta Jahrl. Most sturgeons are anadromous, meaning that the adults live in estuaries and coastal waters and swim upstream to spawn. The Black Sea is one of the most important sturgeon fisheries in the world, second only to the Caspian Sea. The Danube, as one of the major feeder rivers and estuaries of the Black Sea, is crucial for sturgeons. 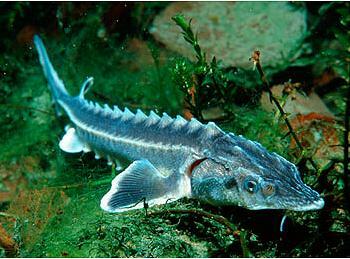 Bulgaria’s one-year ban precedes a five-year ban on sturgeon catching in the Danube, which is planned to start in 2012. An information campaign among fishing communities and better enforcement of the ban also are planned for 2012. In 2007, both Romania and Bulgaria joined the European Union, which Kecse-Nagy says makes any illegal trade in caviar harder to detect and prevent because caviar shipments to EU Member States are no longer recorded in the trade data compiled by the Convention on International Trade in Endangered Species. Due to their location, the two countries are gateways for illegal caviar trade from the Caspian Sea, the world’s most important sturgeon fishery. In 2009, German authorities seized caviar smuggled into the European Union labeled as Bulgarian farmed caviar. Bulgaria and Romania are only permitted to trade in farmed caviar, but isotope analysis demonstrated the caviar had originated from the Caspian Sea. Analysis of legal trade data indicates a large increase in aquaculture production in Bulgaria for export into EU countries and elsewhere. The TRAFFIC report recommends both Romania and Bulgaria raise awareness among enforcement agencies of the illegal caviar trade and strengthen their capacity to control and monitor the trade. “The EU has a major responsibility to regulate the caviar trade because EU member states are the largest consumer of caviar from Romania and the second largest consumer of caviar from Bulgaria,” said Jahrl. “The EU must close every loophole in order to save sturgeons from extinction,” she said. But Jahrl says European caviar consumers know little about the threat posed by the illegal caviar trade, and even traders know very little about the requirements for labeling legal caviar. “It is crucial that traders and consumers do not buy unlabeled caviar. This simple act would strike a major blow against the illegal trade,” said Jahrl. For sturgeon survival, overfishing is the biggest cause for concern, but cutting off sturgeon migration routes, habitat alteration, including hydropower, and pollution are further contributing causes. The World Sturgeon Conservation Society warns that the Danube is the only large river system in Europe where protection of existing but dwindling sturgeon stocks is still possible. The report, “Trade in Sturgeon Caviar in Bulgaria and Romania,” was funded by The Mohamed bin Zayed Species Conservation Fund, Deutsche Bundesstiftung Umwelt and WWF.